So you must approach this review understanding that this release could very well be one of the most significant events on the country music timeline in the last half decade. It also may not be. Time will tell. It’s not that the music on Same Trailer, Different Park is so groundbreaking. It’s where the album is being released from, and the circumstances surrounding it. Kellie Pickler’s 100 Proof also came from Music Row, and is probably a better, more well-rounded, and more country album. But by the time it was released, her label had already decided it would not have the support a major label release needs to reach its potential. With Same Trailer, Different Park, there are no hurdles to jump, no walls to climb. The sky is the limit. Mercury Records Nashville is 100% behind Kacey and this release, even playing their political cards in the openly-collusive ACM Awards nominations process to get her boosted all the way to a Female Vocalist of the Year bid even before she released a major album. Same Trailer, Different Park is the loss of corporate country’s innocence. It is a total flip of perspective from the fare the mainstream country public is used to, and not just because of relatively mild references to smoking pot or girls kissing girls–these cherries were popped years ago. It’s an awakening, an awareness of an alternative set of ideas that dash the mores that keep radio country and its listeners locked in suffocating patterns that don’t allow the soul the space for self-exploration and growth. It affords the listener the right to question their reality, and then it inspires them to find a new reality that is all their own. Same Trailer offers hope for both the individual listener, and the country radio format. As I listened to Same Trailer‘s first song “Silver Lining” for the first time, I physically felt chills. The song is so exquisitely-written, so wise and indelibly touching, you almost lose your breath. When combined with the Kacey songs we already knew about before this release like “Merry Go ‘Round,” (read review) “Follow Your Arrow,” (read review) and final track “It Is What It Is,” just from the caliber of these songs, you couldn’t help but get excited that this album could be something earth moving, and this artist might be “the one” the critical country music fan has been waiting for to return the genre to substance. But from there the album comes back to reality a little bit, especially after a few listens. You begin to realize that Kacey Musgraves is still a young artist trying to find her place in the greater music world, and won’t be able to capture lightning in a bottle every time she sits down to write or record a song. She’ll also be going up against a very male-dominated format wielding an arsenal of catchy, riff-laden singles formulated to cut right to the bone of lazy consumers. This album also has a few filler tracks that leave the listener wondering where some of their favorite Musgraves songs from YouTube are, like the album-worthy “Undermine” that appeared on ABC’s Nashville TV show a while back, or Kacey’s super-witty “Trailer Song” that would have fit the title theme of this album better than others. Instead we got the somewhat plaintive “I Miss You,” and the droning “Stupid,” and a few others that are short of Kacey’s high-caliber potential. 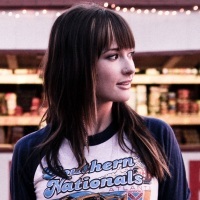 I know, you don’t blow your wad all on one album, but if Kacey Musgraves wanted to make a big leap with this album, she had to feature some of her best songs. However a rising tide raises all boats, and even though Same Trailer, Different Park has some passengers, its strong songs carry the project. When you boil it all down, this is a quintessential Americana album, not a country one, with intelligent songs and sparse arrangements. There’s more drums in 30 seconds of any given Rush song than on this entire album. There’s really no solo parts, and the one’s there are stick very close to the melody. Though the sparse Americana approach can work very well in bringing out the emotion in a song, producer Luke Laird is known more for penning pop hits than channeling T Bone Burnett. The music on Same Trailer is just kind of there, unless it is carried by the words. They got the “less is more” part about Americana right, but didn’t have the right progressive mindset to be truly creative with the open space they created. And there’s no benefit from contrast by including at least a few songs with a truly full sound. The production is playful, even bouncy at times, but always dialed back. It doesn’t always do its job of helping to sell these songs and their message to a greater audience. And though Same Trailer is great for giving you the sense of Kacey Musgraves’ prowess as a songwriter, there’s really not any “moments” in her singing. No sweet spots are hit, no time when you really hear the emotion coming through her tone. For years Music Row has attempted to re-monetize anti-Nashville sentiment with their own music, launching a crop of ‘new Outlaws’ with their “dirt road” and “ice cold beer” vibrato, but in the end they mostly served the same sect of mainstream country listeners since the music was still too steeped in arena rock to woo traditional and classic country fans. Now Music Row may be trying to commercialize the rise of Americana with Kacey, Ashley Monroe, and others, and it will be interesting to see if the Americana Music Association is willing to grow to match Americana’s increased influence, or still pretend that Americana begins with Buddy Miller, and ends with Jim Lauderdale. In the end, the power of the song must be respected, and though the approach of Same Trailer, Different Park may be a little thin in places, most of Kacey’s songs are still giants of American songcraft and shine individually. Will this album change country music for the good? I’m not as optimistic as I was before listening to it. It’s really going to depend on the performance of the singles. But in many ways it’s a victory that this album was even made. It’s not the best mainstream album to come out in years, but its probably the best album that will actually be represented on mainstream radio and awards shows. And with its authentic, inspiring, and intelligent content, this can only be a good thing. I am afraid that “Blowin’ Smoke”, the second single, will not do well on the radio. And that will be that. Not a terrible song, but wouldn’t have been my pick for a second single. Beyond “Merry Go ‘Round,” “Silver Lining,” and “Follow Your Arrow” which they probably won’t release as a single since they already released it digitally, I just don’t here where this album will make a big radio impact. Could be wrong. I didn’t like “Blowing Smoke” until I heard it live, from YouTube of course, but I actually like most of them better on her live YouTube versions. At any rate I think she would be awesome to see live. Still sounds like music row garbage to me. If you can’t distinguish this from Florida-Georgia Line or Tim McGraw’s “Truck Yeah,” that is a very sad commentary. Not all music is for everyone, and I’m not trying to disrespect anyone’s opinion or even change their opinion. But if we cannot offer distinctions between a project like this, and the most bubble gum pop from Taylor Swift or booty anthems from Luke Bryan, we risk branding ourselves as close-minded, reactionary music listeners whose opinion is irrelevant. We look like people who wouldn’t even give our favorite music a chance simply because it was being played on commercial radio. I think a serious case could be made that radio country is improving, however slowly or incrementally. And even though Kacey Musgraves or any other artist may not be our bag specifically, we can still be happy that at least some version of substance is returning to the format. My problem is not with the lyrics necessarily, rather, it’s the production. It doesn’t sound country, or even bluegrass for that matter. Take You and Tequila by Kenny Chesney and Grace Potter. That song could have been great if it had a traditional sound with fiddle and steel in it. I don’t think country radio is improving, I think most everything still sounds the same. If I can’t get past the sound, I’ll never even hear the words. I think this is a very valid and good point, and this was my very concern about this album when listening to it. Hearing someone else have the same reaction makes me think we’re probably not alone. A lot of pundits are praising this album to no end, and though I like it a lot more then I don’t, I think they fumbled a big opportunity with this album on the production side. I don’t think it’s terrible, but when you have high-caliber songs, pull out all the stops. It’s not country, it’s sort of this mild Americana that can’t hold up to the power of the songs. I don’t usually like to get into the “what is real country” argument. I generally think of it as a product of the culture producing it. It changes, otherwise they still wouldn’t allow drums at the Opry. This isn’t a “traditional” country record, but the writing is impeccable. I agree the production gets a little tiring. Country is also the only place where albums or radio matter anymore, and not nearly as much. Kasey’s career will be built on singles that spread via the web. If she doesn’t get air play it won’t matter. I’ve heard enough that I’d gladly buy a ticket to the show, and that’s the key anymore. After reading the review and listening to samples I do see HonkyTonkJunkie’s point to the extent that the production is pretty slickly commercialized to my ear as well. If I were dial twisting or scanning I would pass on this pretty quickly. I agree this isn’t Nashville Trash, but it doesn’t sound very country or even very Americana (compared to say Buddy Miller, Jason Isbell, Gillian Welch or the other favorites in the genre.) It has more of a feel of Wilco or some of the less country sounding Ryan Adams stuff to me. Lyrically, I think the songs are very well crafted and intelligently written, but at the same time I thought songs like Follow your Arrow and Merry go Round had the cliched attitude of a spoiled high schooler trying to rebel, which would be typical of some indie band, but were “Edgy” because it was on a country record because she talked about kissing girls and weed. It’s not a bad record, and certainly a cut above what Nashville normally produces, but it’s not my cup of tea. I got to listen to an early stream of this album last week — I thought “I Miss You” and “Back on the Map” were pretty forgettable, and I wasn’t too keen on “Stupid,” but for the most part I really enjoyed this batch of songs. More like a breath of fresh air than anything soul-shaking or mind-blowing. Besides “Merry Go Round” and “Follow Your Arrow,” I’m especially partial to the clever lyrics and stripped-down sound of “Silver Lining” and “Step Off,” and “Blowin’ Smoke” is a fun bit of storytelling. I think this a a nice showcase of songwriting. However, it’s pretty boring and not something I want to listen to over and over. Silver Lining is my favorite. Since that sameness is part of the corporate music success formula she’ll probably go far. Other than that I like it. Kind of a let down for me so far.I don’t think the hype is worth it..yet.Maybe it will gorw on me the more I listen.As you mentioned,wheres the ‘Trailor Park’ song? Or the John Prine song? Or ‘5 finger discount’? I think “monotonous” is indeed a good word for it.Yes,better than most of anything else coming out of music row right now,but I think I’m stepping off the Kacey bandwagon a step or two for now.In fact,I’d go as far as saying I haven’t been this let down since Jamey Johnsons “Living For A Song” album! It IS nice to read a review that isn’t a complete hard on for her.Anything else I’ve read so far today on it you would think the second coming of Christ was here..Settle down a bit people,k? This was my exact feelings after listening to it again on spotify. I have enjoyed this CD so far, but I do think the songs sound better live than they do on the CD though. After listening to this album, I really would like to hear these songs even more so in a live context to balance it between the recordings. I liked it MUCH better listening to it the second time, but I doubt the ADD generation can sit still long enough to pay attention to it. I was eager to read your review of the album, Trigg, after I gave it a listen this morning. I wasn’t blown away like I expected to be and after reading everywhere that this album is so fantastic I was wondering if I was crazy. I think I agree with everything I read in the article & the comments. I agree about the song writing, the monotony, and what you said about her singing–“no time when you really hear the emotion coming through her tone”. I don’t hate it, but I haven’t downloaded any of it (besides Merry Go ‘Round, which I did back when it was released). I wonder if my expectations were built up so high that satisfaction was impossible. I have to say, I find some of the song titles off-putting. I don’t like Step Off or Stupid. I think they could have easily been Taylor Swift songs. I initially skipped them and then went back to listen, judging them by their song titles I suppose, but in the end my judgement was right. I find it interesting that I liked Silver Lining most and see in the comments that it’s the most favored here. Wonder what that says about it? Also, just a little side-note, I was listening to George Jones-Who’s Gonna Fill Their Shoes while I was reading the article. The lyrics are fantastic, in my honest opinion. Lovely artist, but I think the approach at the sound could been pulled off much better. But it’s a great song and I’d totally support her direction. i really really liked the performance of silver lining but i wasnt at all impressed by the lyrics or the theme except for the very first line which i thought was clever. i know theres a lot more to songwriting than just lyrics so maybe its just my ignorance of songwriting that keeps from appreciating her skills. im not posting this just to put down the song im honestly curious about what it is im missing since you were so enthusiastic about the writing. Agreed…I’ve listened to Silver Linings a few times because everyone says it’s so well-written. Personally I find it to be one of the weaker songs on the album, no more than a bunch of cliches strung together trying too hard to be clever. Merry Go Round and Blowin’ Smoke show how to use cliche and repetition artistically and with wit, but with Silver Linings, every line seems obvious, rather than poetic. I agree any given line in “Silver Lining” could be taken as cliche. They’re all common colloquialisms, and I think that’s one of the points of the song. It is how she crafted them together, and the structure of the song itself that I think is good songwriting. At the same time I see your points, including about “Merry Go ‘Round” and “Blowin’ Smoke.” Yes, for mainstream country this is really deep songwriting. But compared to what most independent fans are used to listening to, it can come across as transparent. But ANY substance on mainstream radio is a victory in my opinion. It would be great if every album was a five-star classic from start to finish, but I think the review and many of these comments are on the harsh side. Ostensibly a debut album from a new artist that has three or four cuts that should impress radio as well as Americana fans (i.e. hits, no matter how you slice it) — plus a couple more above-average songs, and a couple more not-as-strong, but still darn good … so. 6 or 7 or 8 or 9 solid tracks among 12? That’s a pretty stellar performance under the circumstances. Could be better? Sure. Overhyped to a degree? Sure. But I say way more promising than disappointing. And isn’t that what you want from a debut? Promise, potential. Looking forward to more listens of this album and excited to hear what comes next. I think Kacey is Taylor Swift for girls who are not Taylor fans. Similar marketing strategy, but different brand positioning. Taylor is blonde, Kacey is brunette. Taylor was conventional, Kacey is offbeat. Taylor has always been a rich girl, while the character portrayed by Kacey is poor. Not sure if country radio will support Kacey in the longer run. No comments on the music on the album, then? In both cases the key to building a fan base is defining who the target consumer is. In Taylor’s case, the prototypical fan is a 15 year old, upper middle class white girl who attends a suburban high school. She has doting, overprotective parents who have been married for 20 years, go to church on Sundays, and vote Republican (though the daughters prefer Obama). In Kacey’s case, the typical fan is a 20 year old woman, daughter of divorced blue collar workers, living in an older poorer neighborhood in a small town, trying to to make ends meet working at the Wal-Mart. Both singers are playing on identity politics. So, still no comments on the music? Asks the 50-something guy who comes from a two parent nuclear family, who has a decent job, and doesn’t live paycheck to paycheck. I prefer Kacey`s music over Taylor’s mainly because Kacey’s sound is more country. And to be fair Kacey, who did not have the privilege of growing up on Daddy Warbucks’ artificial farm, had to grow up a little faster than T-Swizzle. But I do see similarities between the two. Both come across as whiny, Taylor because some stupid teenage boy made her cry, Kacey because she doesn’t think the people around her are good enough for her. My first thought when I heard Kacey was “Taylor Swift on food stamps”. Your comments make me think of Gretchen Wilson’s debut. Oh my god!! This sounds too good!! All the very best Kacey!! I tried to listen to some of the songs but its too overproduced and soulless. I won’t be picking this one up. I will say that I would be glad to hear this music on the country station when it’s my wife’s turn to listen to her preferred music. I’d call the music Americana lite. Meaningful lyrics, but no real rootsy feel. You mention Buddy Miller and Jim Lauderdale as sort of examples of the AMA’s reluctance to grow along with Americana’s influence. I take you point, but would also say that those two are among the most overtly country of artists identified with the Americana genre. I like the album. The production definitely gets stale after awhile but the lyrics are great. I hear every one of my friends stories in these songs. All the references to smoking are really throwing me off of the music. She’s really trying to push a certain image and it’s really off-putting. My thoughts exactly. I’ve listened to the entire album twice now and the references seem to be in every song (I know they aren’t, it just feels like they are). Since it’s not something I identify with I don’t connect with the songs or the album. I love the album and I love Kacey. I think this is a great step for music. Everything on the album isn’t 100% country, but it’s music at its finest. I agree with you though, I was really hoping to have a studio version of ‘Trailer Song.’ I feel like that was her most country song that she had. I loved ‘Undermine’ too, but I know it was on one of her past independant releases. ‘Silver Lining’ is one of the best songs i’ve heard in a long time, and ‘Follow Your Arrow’ is just great. But I agree some of the songs are just filler that really could have been replaced with her other songs. The thing is, with Kacey I don’t want songs like ‘Blowin Smoke’. A song like that was obviously just put in there to give a little excitement. But with her I like her cynical, tell it how it is songs. I could have listened to a whole album like that. While not perfect, but what album is?, this is so much better, deeper, more well-written, and just has so much more substance than almost all other country music on the radio today. This album, and its hit singles that will be played, can help get country music off of its no-substance-poppy sound that it has today. The production is actually great, and it being boring or it getting old is kinda the point. It doesn’t need huge production. Sometimes quiet and or simple just fits the songs/artist/album better. There is not enough of this sound on country radio today, so I have no complaints about the production. None. I’m thrilled to actually hear something actually worth something as a full album. The only two country albums that in their entirety stand out to me over the last year or two are this one and Church’s Chief.